Did you know that food and weight gain don’t have to go hand in hand? There are actually foods that burn belly fat and squash hunger. The key to maintaining a healthy weight is working with your body’s natural hunger rhythms to curb cravings, blast fat, and increase energy levels. The wrong foods can throw your body’s rhythms out of whack and put your cravings into overdrive. Eating things like chocolate cookies and chips will make you crave more of those calorie-heavy, bad-for-you foods. So how does it work? Foods that burn belly fat don’t melt fat per se, they have properties that work in a number of ways. Some prevent blood sugar spikes and slow down the digestion and absorption of carbs. Others boost the metabolism, which causes your body to burn through your fat reserves. A healthy, balanced diet and exercise regime are key to burning fat and keeping the weight off, but there are certain foods that will help you burn even more! Keeping your hunger at bay is key to preventing over eating and mindless snacking – two things that add fat around the abdominal area. 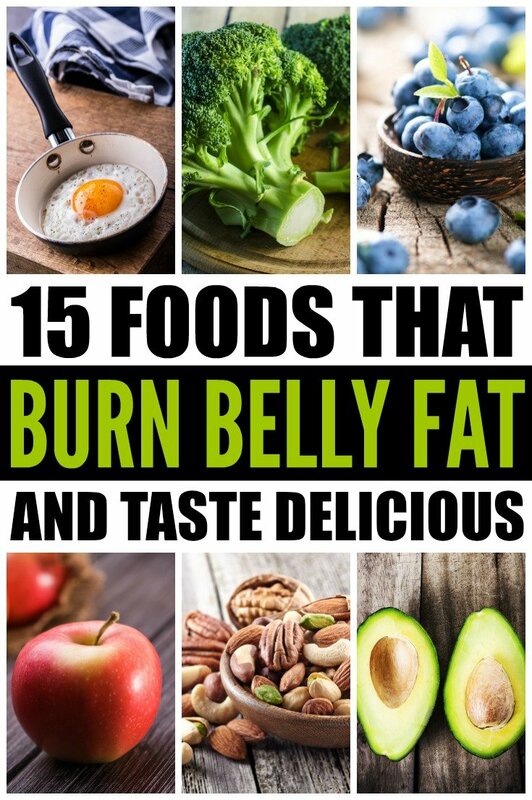 Check out the best 15 foods that burn belly fat. Nuts, such as almonds and walnuts can keep you satisfied for a long time. They are considered “good fats” that are filled with nutrients, protein, and o-mega 3 fatty acids. Nuts increase your energy and metabolism, and in turn, burn excess fat that can accumulate around your mid area. Eggs are one of the best sources of protein you can find. They’re also low in calories and fat, but high in minerals, antioxidants, and leucine, an essential amino acid that burns extra fat. Having one egg a day can aid in weight loss and ensure you’re maintaining a healthy diet. Some of my favourite ways to eat eggs? Hard boiled, or poached on avocado toast! Speaking of avocados, they’re another effective fat-burning food. They contain healthy monosaturated fats, low carbs, and can spot-reduce abdominal fat. They’re vitamin rich and packed with nutrients that can shrink your waist. Avocados are also hunger squashers that keep your belly full and satisfied. A grapefruit sprinkled with natural cane sugar on the side of cereal is one of my favourite breakfasts! Grapefruits are full of fiber, which promotes healthy digestion and keeps you full for longer. This will decrease the urge to snack throughout the day. Oatmeal is packed with numerous health benefits from reducing blood pressure to improving your immune system. It contains fiber, which accelerates weight loss and is one of the best sources of resistance starch, which slows digestion and supresses your appetite. I’m such a sucker for spicy foods and chillies are a great way to bring the heat. Both chili peppers and powder contain casaicin, which burns calories and is one of the most potent antioxidants. Chillies are one of the best ways to blast abdominal fat in a delicious way. Broccoli and other leafy greens like kale and spinach are chock full of vitamins and minerals and low in calories. Broccoli specifically, is packed with fiber to increase your metabolism and reduce constipation. Salmon is a major source of omega-3 fatty acids, which is very beneficial for weight loss. Since your body can’t naturally make this type of fatty acid, you need to gets it elsewhere and salmon is a great place to find it. If you’re not a big fish eater, you can also get omega-3s from fish oil supplements. Beans are one of the best snacks to eat throughout the day. They’re full of fiber which will keep you full and prevent over eating. They’re also high in protein, which stabilizes energy and blood sugar levels and helps curb cravings. Do you know that pumpkin pumps up your energy levels because of its high amount of vitamin C? It’s also low in calories and high in dietary fibers, which means it stays in your stomach longer than low-fiber foods. Pumpkin is a great, not to mention delicious, addition to a protein smoothie! Chia seeds are another one of my favourite smoothie (and smoothie bowl) ingredients. They don’t taste like much, but they’re one of the best antioxidants out there. They’re also a great source of protein and are high in dietary fiber. Pop them in your breakfast smoothie to avoid snacking throughout the rest of the morning. Instead of using sugar, switch it up with cinnamon – it’s a really healthy alternative! Cinnamon has been found to slow down digestion and limit spikes in your blood sugar levels. Eating foods that increase blood sugar causes your body to release insulin, which can then drop your blood sugar levels, which makes you feel hungry again. Not only are blueberries an amazing antioxidant, they also contain zero fat, cholesterol or sodium. They’re super high in vitamins, including vitamin C, which boosts your immune system, and vitamin A, which helps with anti-aging. They also contain fibers that help with digestion. With almost twice as much protein as other yogurts, Greek yogurt (the low-fat, low-sugar kind) is as good as it gets! Since it takes more time to leave your stomach it keeps you full for longer, and you burn more calories digesting protein than digesting things like carbs. Fruits like apples are high in water content, which takes up more room in your gut and leaves less room for other foods. They’re full of water and low in calories, which is perfect if you want to burn belly fat. Eating apples with the peel will give you a boost of fiber and chewing will also help you burn some calories. Remember, eating these foods won’t magically make you lose weight. They will work best to blast belly fat when combined with a proper exercise regime and all around healthy diet! Eat them on the daily for extra belly fat blast! If you found this collection of foods that burn belly fat helpful, please share it on Pinterest! And if you’re looking for more health-related tips and tricks, please follow our Fitness board where we share all kinds of fabulousness!